E.G.O radiant heating elements combined with glass ceramic surfaces have proved their worth in commercial and domestic cooking applications. In the catering trade the sealed cook tops of these ranges are regarded as a great benefit in the professional kitchen. 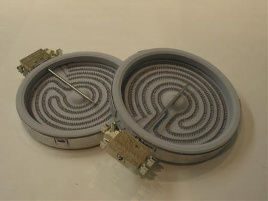 E.G.O have developed round, square and rectangular radiant heating elements with precise temperature control. These are economical, heat up quickly and very reliable. More than 100 million E.G.O radiant heating elements give the performance expected of them in households all over the world, day after day. They stand out for their good looks, performance and quality. The radiant heating elements are an important part of the cooking systems offered by E.G.O. Perfectly matched to their corresponding controls, they provide a very high standard of performance. Thus a high degree of reliability is assured for both the white goods industry and the consumers. 1. Protector: Recyclable material: ceramic, steel. Recycling process: crushing, separation, melting down steel. Recycled product: steel, building material. 2. Insulation ring: Recyclable material: environmentally-friendly thermal insulation. Recycling process: grinding. Recycled product: new insulation components. 3. Heater coil: Recyclable material: steel strip. Recycling process: melting down. Recycled product: steel. 4. Thermal insulation: Recyclable material: environmentally-friendly thermal insulation. Recycling process: grinding. Recycled product: new insulation components. 5. Base plate: Recyclable material: steel strip. Recycling process: grinding. Recycled product: steel. 1. Protector: The protector is a temperature control with permanent settings. It is combined with the capillary tube Thermostat to protect the glass ceramic. 2. Insulation ring: This insulation is used as a thermal protection, as well as a spacer between the heating element and the glass ceramic. 3. Heater coil: The high-quality heater coil ensures short glow-up times. The coil is extremely durable. 4. Thermal insulation: The thermal and electrical insulation components also act as the mount for the heater coil. For all series, it is made from environmentally-friendly, recyclable and harmless materials. 5. 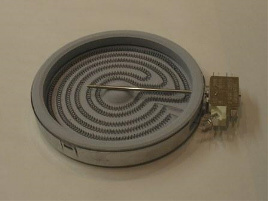 Base plate: The base plate is the mechanical core of the heater coil. It is made from aluminised steel. The structure is designed for ease of assembly.